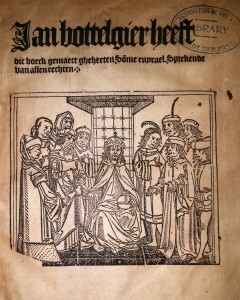 The title page woodcut illustrates a ruler surrounded by his advisors. The original Somme Rurale likely appeared in manuscript in the late fourteenth century as a statement of the customary law of northern France, intended to be accessible to the rustics. Printings appeared beginning in 1479 (the first in Bruges) and were issued at regular intervals in France into the first quarter of the seventeenth century. It was written in the vernacular rather than in Latin, one of the hallmarks of works aimed at elucidating the learned law for nonprofessionals and those lacking a formal education. The customary law treated in the Somme Rurale being similar to that of the Netherlands, it soon was translated into Dutch, with the first Dutch edition appearing in 1483 (Delft) close on the heels of the first printing in 1479. 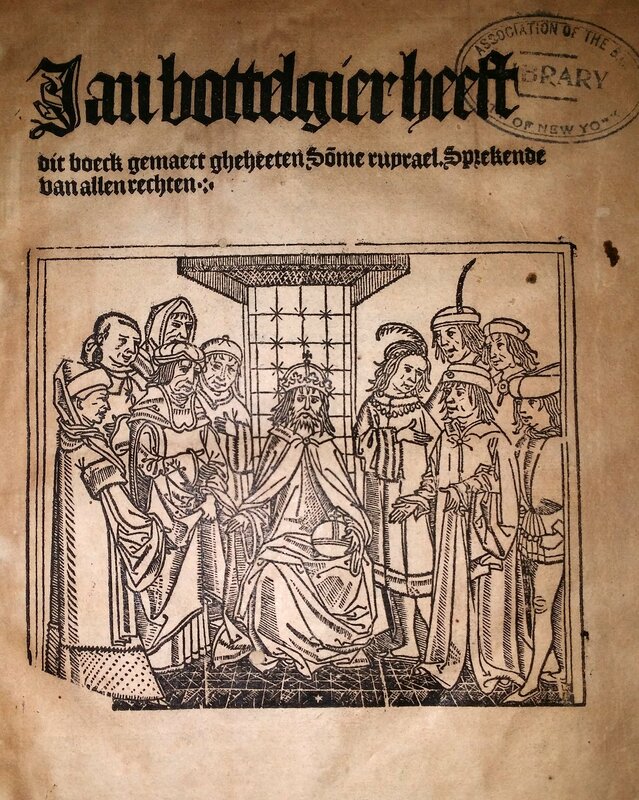 The exemplar recently acquired at auction by the Jacob Burns Law Library, Jan Bottelgier heeft dit boeck gemaect gheheeten So[m]me ruyrael (Antwerp, 1503), belonged to the outstanding historical law collection of the Association of the Bar of the City of New York. The folio volume still is in its wooden boards, with the ornamental blind-stamped leather covering largely intact on the bottom board. It is printed in blackletter in two columns. 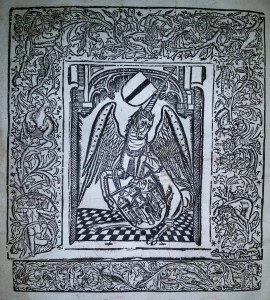 The woodcut illustration on the title page depicts a ruler surrounded by advisors, and the full-page woodcut armorial device on the verso of the final leaf features a winged unicorn. A two-page table of consanguinity appears at ff. 173-174, verso and recto. 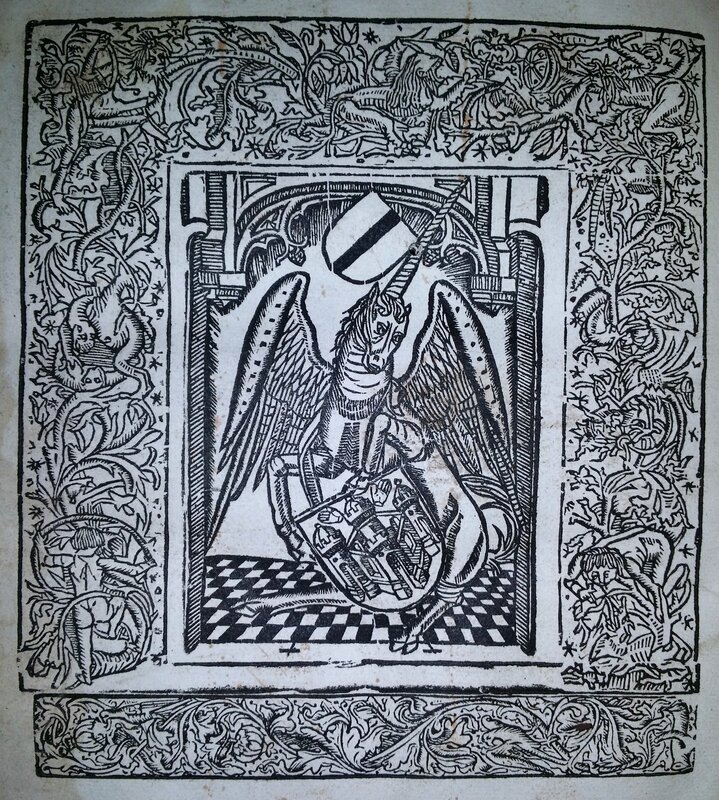 A full-page woodcut armorial device on the final leaf verso depicts a winged unicorn, surrounded by a wide, densely-twining, human-populated foliate border on an acanthus base. A version of this piece appears in LH&RB: Newsletter of the Legal History & Rare Books Special Interest Section of the American Association of Law Libraries, Vol. 21, No. 1 (Spring 2015).